We are doing exciting work at Haystack around low power IoT geolocation and more recently have begun work on a project to develop Proof of Location(PoL) using DASH7 running over LPWAN’s. When a single party controls more than half of the mining power, the bitcoin network is subject to 51% attack because that single party can create the blocks for most of the time. This single miner can reject a valid transaction to be put into the block which creates the censorship in transaction processing. The miner can even alter the record of the previous block by recalculating the difficult mathematical equation which can make someone lose their bitcoin. 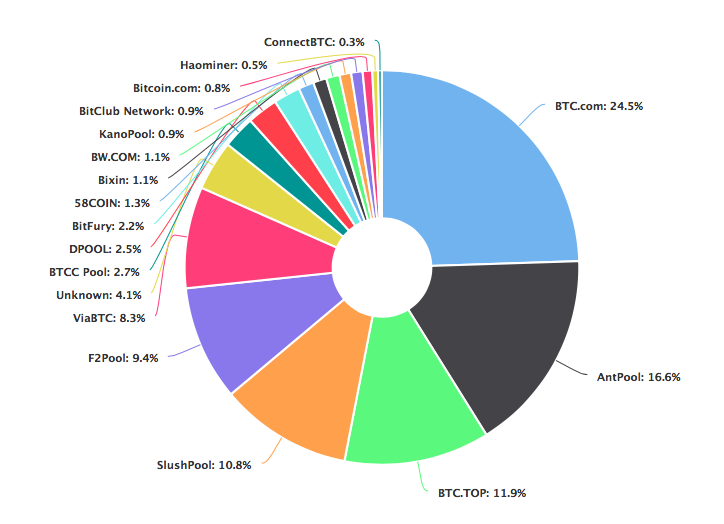 Interestingly, BTC.com and AntPool are both controlled by BitMain, who happens also to be the dominant provider of Bitcoin mining hardware in the world. So yes, a single company controls 41% of the Bitcoin mining pool power in the world. And of course this assumes the mining rigs they sell are free of backdoors or other vulnerabilities that might add to this concentration. Nothing against China or its success in blockchain, but a 51% attack is only a phone call to a mining competitor away. And as cryptocurrency architects attempt to engineer solutions like “ASIC-resistant” protocols, hardware and firmware-savvy engineers outwit them and … the concentration continues apace. Thus, concerns about mining centralization undermining the future of cryptocurrencies are more than valid. I will leave it to others to weigh in about the probabilities of a 51% attack/cooperation, but an entry level game theorist could hypothesize. While PoL is not intended to solve directly for mining concentration by a single company, it can authenticate the geographic location of a given miner to allow future forks of Bitcoin or other cryptocurrencies to mandate geographic diversity when rewarding miners. For example, a future fork of the Bitcoin code could limit the number of block rewards allowed from a given geographic area (country, city, lat/long, etc.) in order to limit the risk of a 51% attack from that same geographic area. GPS-based PoL is surprisingly common in the financial world today, but is easily faked. LORAN, a much-discussed terrestrial backup to GPS, is interesting but like GPS (or GNSS) is a uni-directional signal that is incapable of supporting public key encryption and is therefore spoofable, among other drawbacks. So as we search for alternative means of PoL, basic requirements include a bi-directional wireless protocol, decentralized network topography (i.e., not carrier-based), very low latency, as well as support for public key cryptography. While Bitcoin mining rigs are (obviously) mains-powered, a good many other IoT devices that require PoL are not or will not be: e.g. unmanned aerial drones, Pokemon Go wristbands, access control badges, temperature sensors in a shipment of vaccines, etc. Thus implementing PoL over a low power wireless network is essential to arriving at a standard for PoL. Additionally, LPWAN-based mobile endpoints will serve as important actors in a winning PoL network. Ultimately, I expect to see a global PoL network — perhaps led at the application layer by the team at FOAM — that solves for mining centralization and many other use cases. But the devil in creating this global, decentralized PoL network is really in the physical and networking layers. We believe Low Power Wide Area Network radios like LoRa (and others) are well suited to this job and a radio-agnostic networking stack like this to be the foundation for the future of PoL.